We are one of Florida's Premier Land Surveying companies whose mission is to always act with a firm commitment to Fast and Friendly service at an Affordable rate and to maintain our reputation for Dependability and Experienced service. We have serviced Florida for decades and have well over 200 years of combined staff experience. Our staff is a multi-faceted group of individuals with experience ranging from the surveying industry to the title and real estate industry to banking and appraisals. Our business model is structured as to educate, empower, and promote all staff members as well as encourage a true feeling of accountability toward fellow colleagues. Although Landtec offers comprehensive land surveying services, we specialize in boundary surveying and boundary law. We are specifically structured to offer the finest land surveying services to Florida’s Land Title & Real Estate industry – and equally well structured for residential construction and renovations. Andrew Snyder, P.S.M. 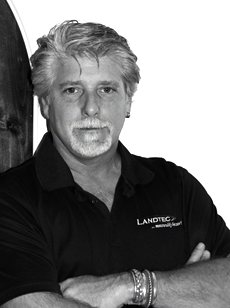 is the Founder, President and licensed Surveyor and Mapper of Landtec. After initially majoring in astrophysics – then architecture, he moved to Florida in 1984 and became involved in land surveying. He soon fell in love with the profession and specialized in boundary law and mortgage related activities. He additionally proceeded to teach himself computer database programming and network operations. During a time of limited computer use within the profession, he profoundly increased efficiency by automating many of the everyday office activities. The company for which he worked soon was fully computerized and within only 3 years he had become General Manager of the firm. Consistently educating himself in the best way to service clients, boundary law and the many local land surveying issues, he would embody all his designs and experience within LandTec Surveying. Mr. Snyder’s expertise is highly respected and not just limited to individual mortgage transactions. He had been selected in assisting H.U.D.’s investigation into the 30 million dollar “Christenson/Kratenstein” Mortgage Fraud scheme here in South Florida; he assisted Governor Jeb Bush regarding the Fort Lauderdale Executive airport; he has been involved with accident scene investigations and has been chosen to provide expert testimony in many court cases. Through extremely efficient office operations, qualified field personnel, high professional ethics, and a very keen eye toward customer service, Landtec is committed to earning customer’s trust and offering the best surveying services available to the Land Title and Real Estate Industries.